Larry Madowo picked a fight with Ezekiel Mutua because of the lesbian movie that was banned in Kenya. 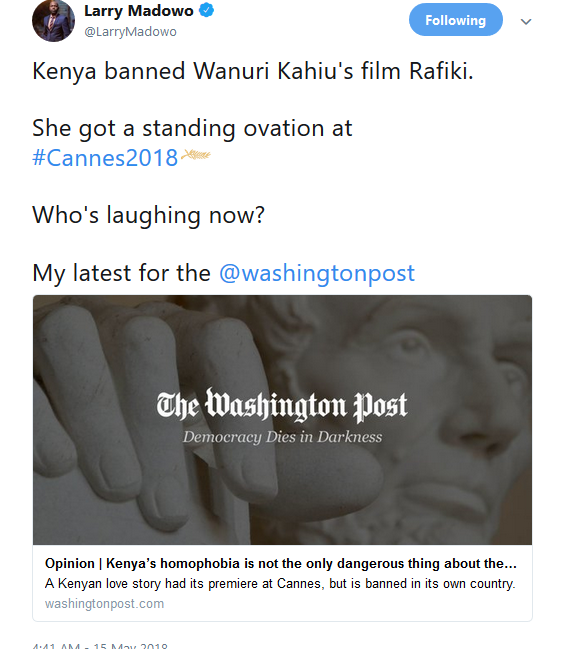 The moral police banned “Rafiki”, a lesbian love story directed by Wanuri Kahiu. Mutua explained that “Rafiki” was prohibited in Kenya because its homosexual theme demonstrates clear intent to promote lesbianism in Kenya contrary to the law. Larry taunted Mutua when “Rafiki” became the first Kenyan film to be selected to screen at the prestigious Cannes Film Festival. The former NTV anchor savagely condemned Mutua in an article he wrote on The Washington Post. He said Kenya’s content regulations is maiming the industry. “If the Oscar-winning performance by Lupita Nyong’o in “12 Years A Slave” was in a Kenyan movie, her film probably would have been banned for being too obscene. That is how dumb Kenya’s content regulations have become, with an overzealous censorship board and a public that seems to believe any material it disagrees with should be banned. The tone-deaf Kenya Film Classification Board and its hopelessly conceited leader Ezekiel Mutua (who once compared himself to the Rev. Martin Luther King Jr.) clearly have support from the top ranks in government,” wrote Madowo in part. 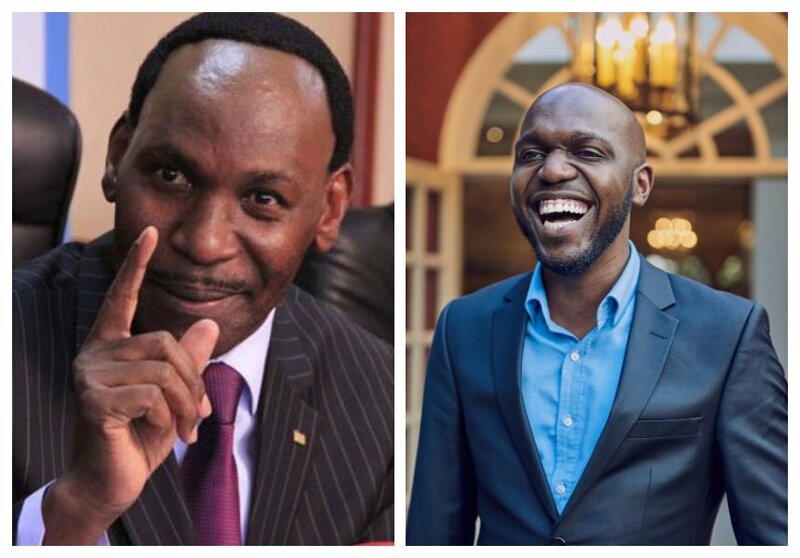 The moral police fired back at Larry Madowo in a tweet. Mutua says Larry has no moral authority to lecture anyone about life, family or Godliness. 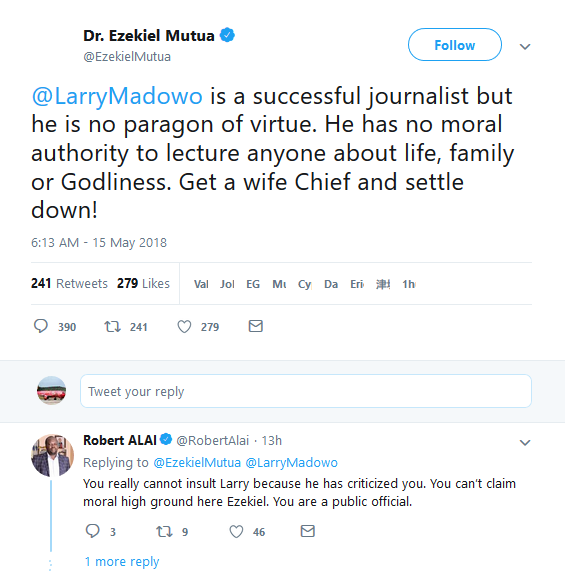 “@LarryMadowo is a successful journalist but he is no paragon of virtue. He has no moral authority to lecture anyone about life, family or Godliness. Get a wife Chief and settle down!” Ezekiel Mutua tweeted.